It has been a difficult week for America and the world. American leadership in the world seems to be collapsing as nations considered to be our allies are criticized and nations thought to be adversarial are applauded as friends. The old world order established after World War II where the United States invested in western Europe to prevent the spread of totalitarianism is being dismantled in favor of an “America First” foreign policy. The NATO alliance has been a bulwark of that order, which has maintained global peace for seventy years. As teachers prepare for the upcoming school year, these events will find their way into new lesson plans, and students will want to know what these events mean for America and the world. Sadly, authoritarianism and support for dictators appears to have become US foreign policy. World leaders equivocate and contradict themselves in the hope that the masses can be fooled so that those in power continue to deceive their constituencies, maintain corporate control over average and disadvantaged people, and justify policies that have long been denounced as undemocratic and oppressive. As the world watched America’s leaders meet with the NATO alliance in Brussels and with the Russian president in Helsinki, the Wilsonian ideal of “open covenants openly arrived at” in international affairs seemed to have dissipated in favor of backdoor meetings, lack of accountability, and complicit behavior on the part of branches of government charged by the Constitution with oversight responsibility. In this atmosphere of corruption, who can teachers look to in order to find a role model for themselves and their students? In the recent past, teachers could always point to their public servants as role models for themselves and their students to emulate. Washington’s leadership, Lincoln’s honesty, Teddy Roosevelt’s fortitude, and FDR’s optimism have all been embedded in our history lessons as ideals that teachers could point to and emulate. To illustrate volunteerism and civic responsibility, teachers could point to JFK’s inaugural address, where he famously said, “Ask not what your county could do for you. Ask what you can do for your country.” Teachers can use Jimmy Carter’s work with Habitat for Humanity to reinforce the positive role of former presidents in helping others. In the light of duplicity and obfuscation at the highest levels of American government today, teachers can look to the recent speech of Barack Obama in South Africa, given on the 100th anniversary of the birth of Nelson Mandela as a role model, not just for their students, but for themselves as educators and leaders of young people. What did Obama say in Johannesburg and how did he say it? Obama was addressing a crowd of 15,000 on July 18, the 100th anniversary of the birth of Nelson Mandela at the same time American leaders were conferring with the Russian President in Helsinki. Former President Obama has made a strong effort to speak out against the policies of his successor only when necessary and without mentioning his name. President Obama is a strong believer in the practice that former presidents respect the actions of those who follow them into the Oval Office. The idea behind this protocol is that America has one president at a time. Obama thanked George W. Bush for his graciousness during his transition, so he has been reserved in being critical of POTUS 45. 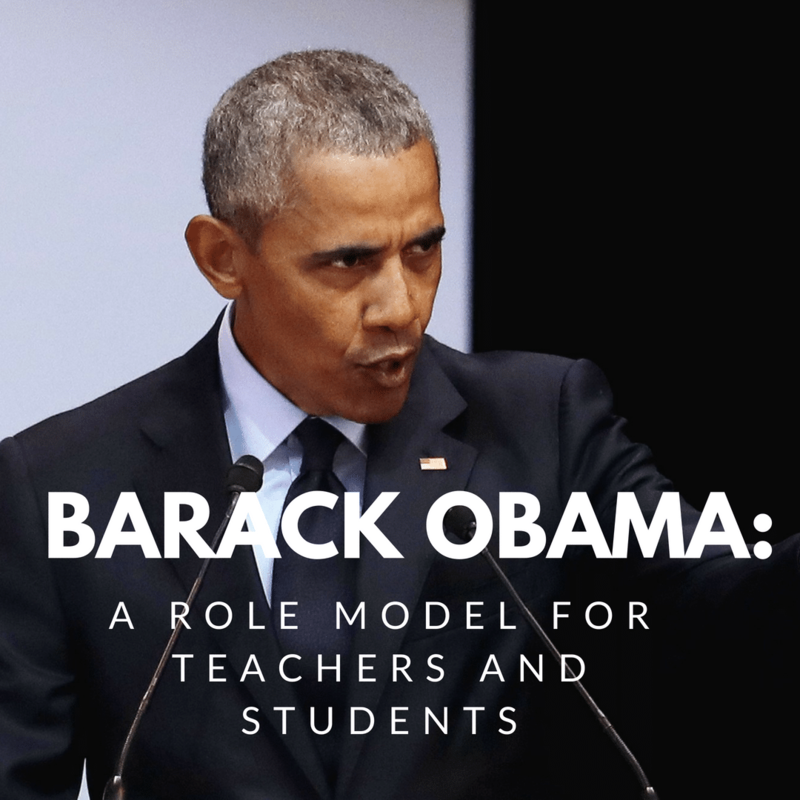 Teachers can take a page from the Obama playbook and refrain from expressing an opinion on specific policies established by the various levels of the US government. Teachers can explain, help students discuss and understand policies, and set historical context. They can help students compare and contrast previous policies and administrations, but they should refrain from passing judgment. They must allow students to evaluate the actions of their government according to standards set by the constitution,m precedent, and settled statutory law. So he understands the value of using humor to establish a welcoming classroom atmosphere. The National Education Association recommends the use of humor in the classroom to establish a comfortable learning environment. Humor, when kept appropriate for the classroom and for the age group at hand, helps stimulate the brain and can be used to make academic content more real and approachable for students. Without a doubt, Obama’s audience of 15,000 was automatically charmed by his use of humor, his ability to disarm his listeners, and his ability to make this larger-than-life figure appear human and friendly as he began his speech. President Obama referred to Nelson Mandela, the subject of his address, as Madiba, his tribal name. This usage illustrates another aspect of Obama’s superior teaching ability: he is able to relate to the culture of his audience, meeting them where they are, introducing his subject by using what is familiar to them. Obama went on to outline the life and legacy of Nelson Mandela, even discussing the way he obtained his colonial name (it was given to him by a teacher). He discussed the vision of Mandela, what came to be called the “long walk to freedom.” He described Mandela’s fight for equality against the white-dominated Apartheid regime in South Africa. Mandela walked in the peaceful tradition of Gandhi and King even though he was imprisoned for 27 years on Robin’s Island. Once released, he marched for peace and reconciliation, becoming South Africa’s first black president, a title he holds in common with President Obama, the first black president of the United States. Both men also were awarded the Nobel Peace Prize, Mandela for his work to unite white and black South Africans in ending Apartheid, and Obama for the potential he brought to the presidency in ending racial prejudice in the United States. These two leaders and the leaders they emulated in their own political careers act as inspirations for us educators. They led their people to reach a higher moral plane for their respective nations. By discussing the actions and beliefs of these leaders, students can regard their teachers as vanguards of those positive political concepts without having to take sides in the political debate. I should add, by the way, right now I’m actually surprised by how much money I got, and let me tell you something: I don’t have half as much as most of these folks or a tenth or a hundredth. There’s only so much you can eat. There’s only so big a house you can have. (Cheers and applause.) There’s only so many nice trips you can take. I mean, it’s enough. (Laughter.) You don’t have to take a vow of poverty just to say, “Well, let me help out and let a few of the other folks – let me look at that child out there who doesn’t have enough to eat or needs some school fees, let me help him out. I’ll pay a little more in taxes. It’s okay. I can afford it.” (Cheers and applause.) I mean, it shows a poverty of ambition to just want to take more and more and more, instead of saying, “Wow, I’ve got so much. Who can I help? How can I give more and more and more?” (Cheers and applause.) That’s ambition. That’s impact. That’s influence. What an amazing gift to be able to help people, not just yourself. In this passage of the speech, which he added extemporaneously, he contrasts himself with the billionaire class now controlling a majority of the wealth in the United States. The idea here is not that teachers are wealthy and that they should be willing to give their hard-earned income to charity. Nevertheless, he should all be able to count our blessings, recognize the strength of our economic standing in the world, and “pay it forward” by helping others when we can. Many teachers already do this by purchasing school supplies for their students, by giving extra time to those who are struggling, and by volunteering in their communities to make their neighborhoods a better place to live. For Obama, he was wondering how much our world would be a better place if those who had millions or billions could use their wealth in ways that uplift people in communities less fortunate all over the world. President Obama is a liberal by the standards of American politics, but his speech called for the strengthening of liberal democracy around the world in a much broader sense. His political affiliation is with that of the Democratic Party, but his speech called for the strengthening of democratic institutions that can be used by average people to counteract the forces of racism and reaction. Conservatives and Republicans can embrace the post-presidency “Obama Doctrine” as he espoused it in South Africa that day because the ideals he expressed are American ideals, founded by the Declaration of Independence and the Constitution. Failing to do so forces those who reject his message to check their white privilege and overt racism at the door. President Obama does not hide his light under a bushel. As teachers, neither should we.